Someone shared this fascinating video with me and I wanted to pass it onto my lovely followers. 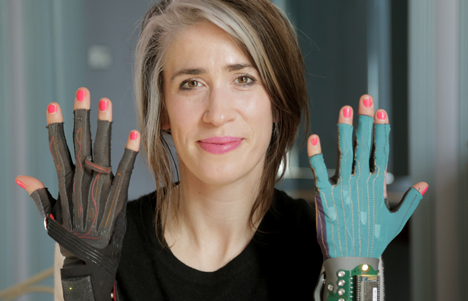 The video features a Wired Talk by song writer and composer Imogen Heap, and is about her tech savvy, musical gloves. Although this is a twenty minute video, I do recommend you watch the full thing to truly understand how the revolutionary gloves work. So if you’ve ever watched a musician (or been one yourself) struggle to carry a heavy kit of instruments and synthesises, you’ll understand how handy this invention is to eliminate that hassle. The gloves create sounds of different qualities, using simple movements on stage to activate each effect. If you’re in a hurry, skip to 13:19 on the video and watch Imogen’s performance of “Me the Machine”, a song that showcases what the gloves can do. “Me the Machine” is a beautiful song and the gloves add a practical kind of physicalisation to the performance. It will be interesting to see if the gloves take off with other musicians over the next few years.